The connection broker is responsible for ensuring that the remote user receives the proper virtual machine. See why else RDS relies on it. What is the connection broker's role? The connection broker is responsible for ensuring that the remote user receives the proper VM. 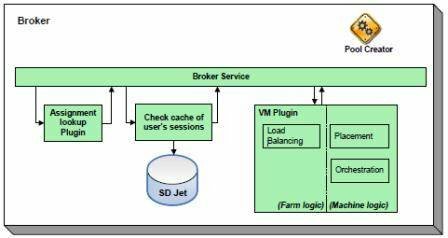 It does this through a process-based approach: A remote user requests access to a VM via a Web portal, and the connection broker determines which VM to deliver from the VM pool. In addition, the connection broker looks for cached sessions so that any interrupted session can be quickly restored. It may rely on load-balancing or load-leveling technologies to spool up a new VM session for a user, which helps maximize performance and reduce latency.